Bad weather, like other adversity, can bring out the best and the worst in people. After an hour-long neighbourly street-clearing session yesterday, I was able to make it into town to replenish essential supplies (milk, butter, spiral notebooks). 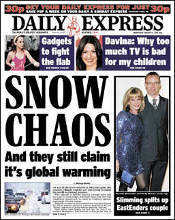 I noticed the Daily Express front page used the cold weather as an excuse to take a shot at global warming. As I couldn’t bring myself to buy the paper, all I have the online version, which seems to have suppressed the controversial subheading. Roy Greenslade quotes the opening sentence: ‘As one of the worst winters in 100 years grips the country, climate experts are still trying to claim the world is getting warmer.’ Has global warming taken over from Princess Diana as their favourite subject for conspiracy theories? Deborah Orr asked in Wednesday’s Guardian: ‘Are some people really this stupid?’ I can’t find this bit of her column online; perhaps they don’t like to offend fellow-journalists too much? 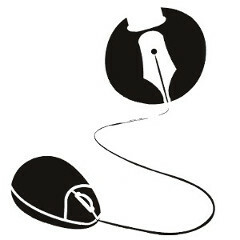 Elsewhere, clichés abound. I enjoyed two Guardian headlines: ‘Passengers grit their teeth while children enjoy a day off school’ (7 January) and ‘The man from the council helping put grit into Britain’ (6 January). Although grit is in short supply, it would seem from the first headline toothpaste is even scarcer, if people are having to grit their teeth rather than their pavements…. Sometimes even a cement mixer can have a certain poetic charm, when it is blanketed under several inches of snow. 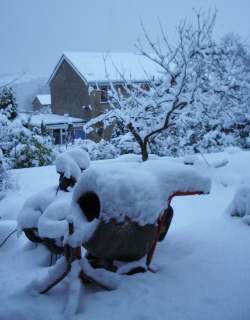 And so it was this afternoon in our Derbyshire back garden. … but this ‘bleak mid-winter’ isn’t ‘long ago’ but with us for the rest of the week. It’s a good job the email can get through, as the Royal Mail didn’t!